Ever want to go out into a huge cornfield and just pick ears of corn to set on your table for a feeling of “Fall”? These little corn cobs are easy to make and will give you a wonderful addition to your fall décor or accent for that special doll you're making. They also make a great bowl filler. 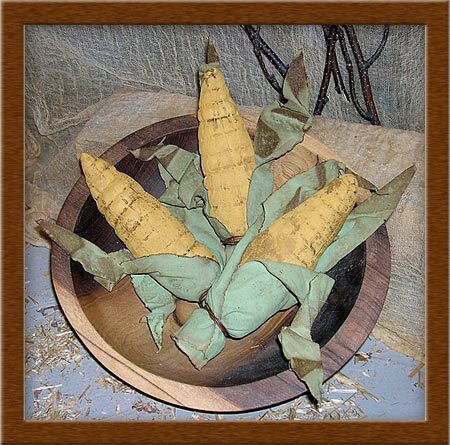 Each cob is made from painted and distressed muslin. They have been distressed and baked to give them a “crunchy” and aged appearance. Each cob measures approximately 8” long. "Harvest Corn" is an original Soft in the Head design by P.K. Gracia (©2006).